No team ran the ball more often than the Jacksonville Jaguars in both relative and absolute terms in 2017. While Doug Marrone's hope of zero pass attempts for Blake Bortles did not come to fruition, but the heavily-scrutinized quarterback did throw 102 fewer pass attempts in 2017 (625) than in 2016 (523). Plus, the team's best wide receiver -- Allen Robinson -- was lost for the season early in Week 1. Despite all those things working against him, Bortles still finished as fantasy's QB13 on the year. While garbage-time production fueled strong QB4 and QB10 performances in 2015 and 2016, respectively, he produced mostly as the team played with the lead in 2017. With a first-place schedule, duplicating last year's 12-win record may prove challenging. After all, Andrew Luck missed all of 2017 and Deshaun Watson more than half of the season. The division alone will be more challenging. Ignoring that for a second, Bortles may not have the QB4 type of upside we witnessed in 2015, but a more challenging schedule and need to throw a little more often could potentially lead to a top-10 campaign like 2016. To be fair, there are more than 10 quarterbacks I'd draft ahead of him. In fact, he's ranked as my QB19. With an ECR on FantasyPros of QB22, however, I'm a little more bullish on his outlook than my counterparts. After all, many conditions in 2018 are more favorable for Bortles than they were in 2017 and, remember, he finished as the QB13 last season. Of course, rushing stats really help Bortles. With 50-plus rush attempts and 300-plus rushing yards in all four seasons, Bortles also has multiple rushing scores in each of the past three seasons. Since entering the league in 2014, only four quarterbacks have more rushing yards than Bortles (1,410) -- Cam Newton (2,288), Russell Wilson (2,247) and Tyrod Taylor (1,410). Even though the team lost A-Rob to free agency, the receiving corps is as solid as last season, especially considering the team was essentially without Robinson. The team re-signed Marqise Lee and rookies Keelan Cole and Dede Westbrook could take steps forward. The Jags added Donte Moncrief, a high-upside option if he can stay healthy and put it all together given his athletic traits. In addition, Austin Seferian-Jenkins is an upgrade as a pass-catcher over Marcedes Lewis, who is now in Green Bay. 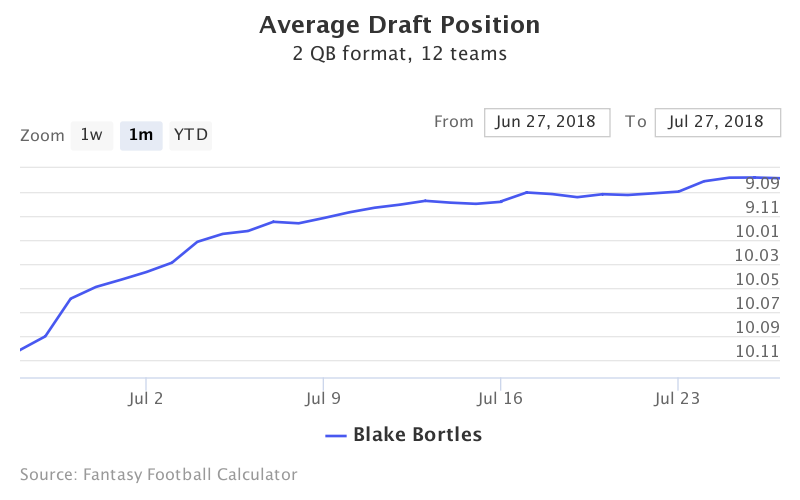 Going in to the 2018 season, no quarterback has a more favorable fantasy strength of schedule than Bortles based on the cumulative fantasy points allowed in 2017 of his opponents in 2018. That said, his SOS during the fantasy playoffs (Weeks 14 to 16) is less favorable (13th of 32) with matchups against Tennessee, Washington and Miami. While his ADP in 12-team drafts is outside the top-25 quarterbacks and therefore not listed on FFC, we've included his 2-QB league ADP chart instead. He's the QB26 in 2-QB ADP. Certainly, I wouldn't feel comfortable going into the season with Bortles as my starter in a standard-sized, one-QB league. That said, he's a high-upside QB2 in two-QB leagues and/or worth a look as a streaming option (in many weeks given his favorable strength of schedule). As difficult as it might be to replicate Jacksonville's 12-win season, a more favorable game script (in terms of fantasy production) could be in the cards for Bortles in 2018.